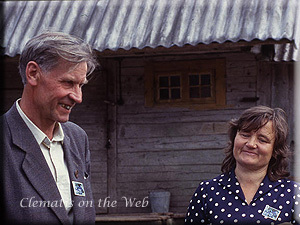 Uno and Aili Kivistik photographed at their farm during a visit of the International Clematis Society in 1992. Uno Kivistik (1932-1998) bred clematis on the family farm, Roogoja, in Estonia during the period 1979 to 1996. During that time he and his wife, Aili, raised nearly 150 named cultivars. The nursery is now run by one of their two sons, Taavi, with his wife Aime. Uno Kivistik was one of four brothers who were engaged, with their father, in growing and breeding plants. Uno was interested, not only in clematis, but also in apples, pears, grapes and roses. Several of his varieties of apple and rose are available in Estonia to this day. Around 1974 Uno became seriously interested in clematis, collecting cultivars from all over the Baltic region and from the former Soviet Union. With the help of his wife he started to breed clematis and apparently raised over 6,000 hybrids of which about 150 were deemed good enough to name. He was particularly interested in raising early-blooming, Group 3 clematis that would survive the severe Estonian winters and thrive in the relatively short summer. Uno Kivistik was the founder and long-time Chairman of the Estonian Clematis Club, an organisation that still thrives. It is perhaps not surprising that a clematis should be named after such a prominent breeder but, unusually, Uno Kivistik has two clematis cultivars which bear his name: 'Uno' was raised by M F Sharonova in the USSR during the 1970s and 'Uno Kivistik' raised by Taavi and Aime Kivistik in the last few years.